Remember all that whining I did about things not going according to plan yesterday? Well, the Gods wanted to remind me that you don’t need to plan everything down to the minute detail all the time. (Obviously, we need to go bowling so they can get to know me better… and so I can persuade them differently.) 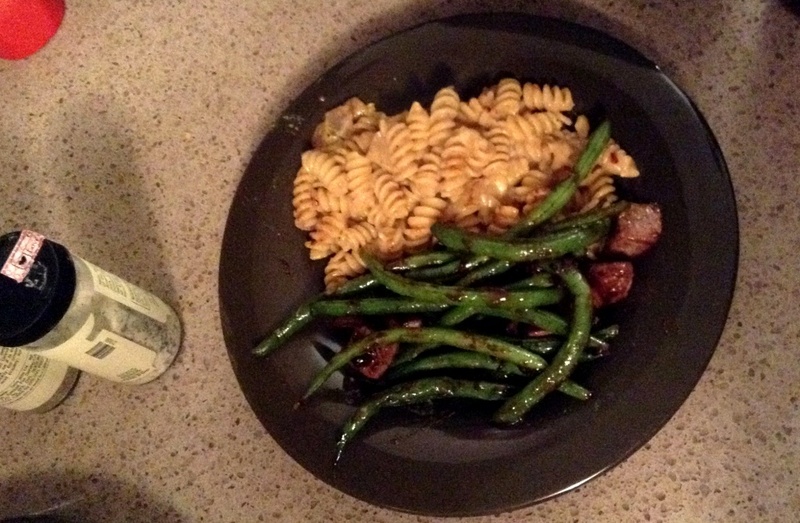 Last night I made dinner using Thanksgiving leftovers and was quite surprised by the success! When I made my pumpkin pie recipe last week, it created enough filling for two pies. I only needed one. I saved the rest of the liquid thinking a pasta dish like this or muffins would be in my future. Monday night found me with a pound of boiled rotini noodles and a half of an onion sauteing in the garlic butter I made for the bread on fondue night. I added one cup of water and the pumpkin pie liquid to the onions and let it boil for a couple of minutes. After pouring the mixture in to the noodles, I slowly stirred in one cup of Swiss cheese. I gave the mixture a liberal dash of more garlic salt and a bunch of pepper and ta – da, success! Next time, I will probably turn it out into a casserole dish and give it a good 15 minutes in the oven at 350 degrees to help the flavors meld even more. I served this along side a stir-fry of sorts using leftover beef stew meet and green beans from fondue night (which I fried with more garlic butter and a bottled stir-fry sauce.) 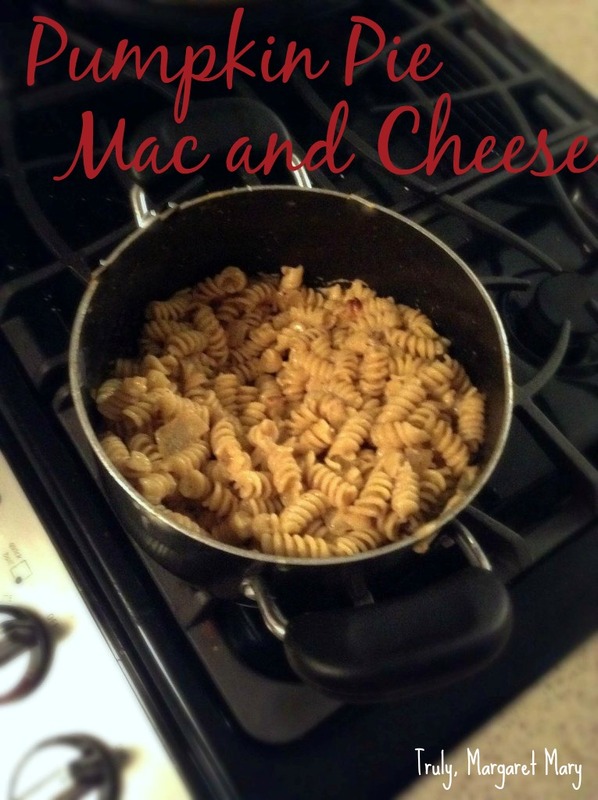 This mac and cheese is definitely on the sweet side, so I would suggest a salty main course. It would be good with a slow-cooked pork tenderloin or even barbecue chicken, if your sauce is on the tangy side. I once made pumpkin chocolate chip cookies by literally scooping out the pumpkin pie filling from a leftover pie. I bet the same could be done here, just adding more water or milk as you go to make sure you had enough liquid. I think the filling will melt over heat, but don’t quote me on that. 1. * This recipe is meant to use up leftover pumpkin pie filling - cooked or still in liquid form. If you do not have this on hand, consider making this recipe or mixing a half a can of pumpkin with a half cup of evaporated milk. Add cinnamon, ginger, cloves, and nutmeg to taste. 2. Saute chopped onion in olive oil or butter in a medium pan for 8-10 minutes until soft. Add garlic salt and pepper to taste. 3. Boil noodles in boiling salted water. Add one cup of the cooking liquid to a the saute pan and drain noodles. 4. Add pumpkin pie filling to the saute pan. Bring to a boil. Let simmer for 2 or 3 minutes until slightly thickened. Stir often. Add this mixture back to the pasta pot. Stir. Slowly stir in Swiss cheese, reserving a quarter cup of cheese. Again, garlic salt and pepper to taste. 5. Optional step: pour macaroni and cheese into a buttered casserole dish, top with reserved cheese, and bake in the oven for 15 minutes at 350 degrees. Alternatively, serve directly from pot, sprinkling reserved cheese on each individual plate. What’s the craziest thing you’ve made out of your Thanksgiving leftovers?